While other companies only offer a few basic fabric choices for your quilt. 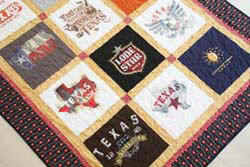 T-Shirt Quilts of Texas stocks several hundred bolts of fabric and you can choose from 2-4 fabrics from most fabrics in stock, including quilt shop quality flannel ** for the back of the quilt for that extra cozy effect. All of my fabrics are quilt shop quality fabrics, mostly from Quilting Treasures, Blank Textiles, Wilmington, Moda Fabrics or P&B Textiles, but also include Robert Kaufman, Maywood Studios, RJR, Choice and Marcus Brothers. If you have been using other fabrics, you will be able to feel the difference! It is softer and smoother, and has a tighter weave, so it will last longer. By selecting a cotton fabric for both the front and back of your t-shirt quilt, you will have a lighter weight quilt. A flannel backing adds a little bit more weight and makes a heavier quilt. Fleece or a 'brand new sheet' are not good choices for a quilt. Some of the 'cheaper' places offer fleece and no batting. They are making a blanket, not a quilt. Denim/Fatigues. We do not carry denim, but will use it if you supply the fabric. We do not use denim for backing as it makes the quilt too heavy. Minkee. Ummm no. It is OK for baby quilts, but nothing else. If you would like fabric samples, send $5 for each colorway, and a large SASE. Be sure to indicate which colorway you are interested in. Our fabric inventory is always changing as we go to Quilt Market and discover new and exciting prints. Some fabrics are limited editions and can not be re-ordered. How about we take a picture of the colorway you are interested in and email a picture... Easier for both of us. We use Legacy 80/20 Blend or HOBBS Heirloom® Premium cotton blend batting. Both are 80% unbleached cotton & 20% polyester. 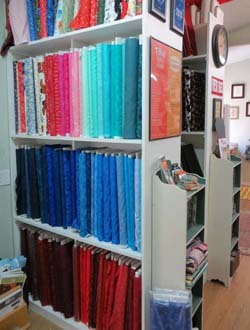 We have over 500 bolts of fabric in house to pick the perfect colors for your quilt. Whether you come to the studio and pick the fabrics, or you give us an idea of what you would like. We will do our best to select the best color choices for your custom quilt. Our fabric inventory is continually being updated. We don't limit you to a single colorway. As you can see, we stock many fabrics in each color.. Some fabrics are regularly stocked, and others may be phased out. We are happy to work with you to get the perfect colors for your one-of-a-kind quilt. We only use high quality quilting thread. 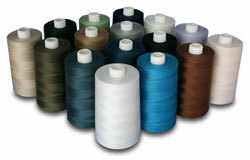 We keep a wide selection of thread colors on hand, and select the best thread color to blend with your quilt. We use the highest quality 100% cotton interfacing to stabilize the t-shirts. It is NOT that stiff cheap polyester stuff that a everyone else offers.